Charley Roberts declared as a Baha'i in April 1962. 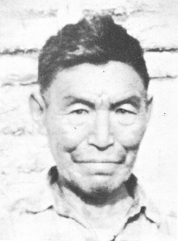 He was born on March 15, 1898 and died August 1, 1969 in Fort Yukon. The following is a story about him by John E. Kolstoe. Little is known of the early life of Charley Roberts, the first Athabascan Indian north of the Arctic Circle to embrace the Cause of Baha’u’llah. We first met on the ice of the Yukon River in Fort Yukon, Alaska, in April, 1962, the last year of the Guardian’s Ten Year Crusade. It as really more of an experience than a meeting; he looked into my eyes as if he were seeing clear through me and reading my soul. My wife Beverly and I had pioneered to the village of Fort Yukon and found employment as school teachers. Having been cautioned by the officials about teaching our Faith, we were circumspect. I wished to cement a friendship with the elderly man with the penetrating gaze but planed to avoid any talk about religion. I walked the two miles through the snow to Charley’s cabin. Charley immediately brushed aside my attempt at caution. I had no more than entered his cabin when he said, “What church do you belong to John?” That day Charley learned about Baha’u’llah. Ten years before direct teaching on an organized basis got underway in Alaska, Charley had a vision of the potential response in the north and grieved at the inability of his fellow Baha’is to meet the pace he set. The pain of having the insight but not the full ad organized support for direct mass teaching drove him to seek solitude; at times he would go off for months by himself into the woods, returning with renewed strength, Charley was a man to fear; he had a flash temper and the strength of two men. When Baha’u’llah touched his heart, an overwhelming love conquered his rage and he developed remarkable patience. With that sense of urgency and intensity of faith which must have burned in the breasts of the martyrs, Charley foreshadowed the fulfillment of ‘Abdu’l-Baha’s prophecy:....should these Indians be educated and properly guided there can be no doubt that through the Divine teachings they will become so enlightened that the whole earth will be illumined. Though unlettered, though he had difficulty mastering the pronunciation of the name of his Lord, the fire of his faith and his love for Baha’u’llah burned with a brilliance that has continued to shed illumination in the north long after his passing. His magnanimous spirit was matched by his hearty laughter, his love of children, the songs he would sing and the stories he would tell of the old days, of the crow, the bear, the fly or the salmon. he loved to tease and had a knack of giving his loved ones, especially children, endearing though whimsical Indian names that captured their personalities. I last saw Charley the winter before he died. He was over seventy then but his spirit and enthusiasm were boundless still. We sat in the dim yellow kerosene light of his small cabin where we had first talked of Baha’u’llah. I think we both sensed that it was our last meeting. He was planning to travel to the village of Chalkyitsik because there was someone there “who will join us”. He had an enrollment card and asked me to fill in the address: he would take care of the rest. Agnes Parent Harrison was the first Alaskan Native to become Baha’i while living in Alaska. (Melba Call King was the first Alaskan Native to become Baha’i, but she was living in Albuquerque, New Mexico when she declared.) Agnes declared in Anchorage, Alaksa in June for 1949. Agnes was from Kuskokwim village of Chauthabluk (lots of big blueberries) a village started by her great-great grandfather after he broke Eskimo Law and married an Indian woman. Harrison’s mother spoke more than 300 Native dialects, but no English. Her father a French-Canadian gold miner and the only white man in the village spoke no dialect. Later in life, Agnes received a bachelor’s degree from the Washington Women’s College of Education in Bellingham Washington and returned to Alaska to teach in BIA schools until she was fired for teaching in a Native dialect and using her custom-designed curriculum featuring Native stories and art instead of the government-sanctioned outline. Agnes later became the first Inuit to be appointed a judge in Alaska. She was appointed by then president Dwight Eisenhower. 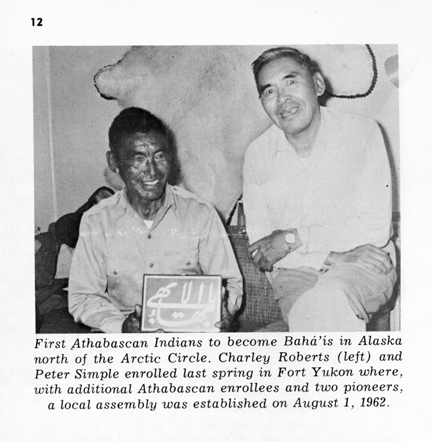 Peter Simple and Charley Roberts were the first Athabascan Indians to become Baha’i in Alaska north of the Arctic Circle. They declared around 1961-1962. Peter was born in 1898. He married Mary Simple (maiden name unknown at this time) and they had 5 children. Peter died in August of 1971.